On November 12, Lydia Davis gave a talk at CalArts culled from her forthcoming collection of stories, Can’t and Won’t. Davis has been recording her dreams, writing them down, and working them into fiction, then engages the inverse: writing lived experience as dream, as absurd occurrence. Maurice Blanchot’s mise-en-abyme, Michel Leiris’s Nights as Day and Days as Night, and Alain Badiou’s Being and Event all featured prominently in her musings on the porosity between waking and dream life, fiction and nonfiction, the lucid and the irrational. Blanchot’s desire to experience writing as experience, and Badiou’s event, of disappearance and consequences for Being and subject, in particular, collide. The writing subject disappears as such at the moment of writing, as one attempts to capture the reality without real convention to get at the experience of human thought. Through dream and through thinking in multiple languages, Davis makes palpable the absurd pleasure and impossibility of translating the mind's work with words. How close she feels the phenomenon of reading and of dreaming are, as ‘suspension of disbelief’ and the near-shutdown of the prefrontal cortex, the planning and logic center of the brain, bear relation. The brain exercises differently in reading and in dream; Davis suggests, as others have, that experimentation in writing is calisthetics for the reading brain, making it grow. In one piece, Davis’ left hand is a subject in itself, separate from her, with its own experience, with predilictions and habits born in another time and space, in another country. This is real. Davis accounts for it. Many in the audience, as she spoke, understood, with that mix of familiarity and discomfort that comes from accepting illogicality. Hallucination as a natural state of readerly conjure, perhaps organizationally, syntactically induced by withholding, manipulating the expected order. Nouns and verbs fall on odd notes. A peculiar action is not the final scene, the punchline of a dream. Instead a return to “normality,” whether smooth or abrupt, is what makes the uncanny resonate. Davis studies her own dreams and in so doing learns a new language that she in turn applies to her approach to prose. She extracts this language, too, from Flaubert. In his letters, she found passages of floating travelogue recalled from nights peering through carriage windows and recounted to an addressee as if through the fog of sleep. Davis culled and translated these passages—linguistically and formally—into a liminal space between the lived and the conjured, what we might call story, but what Davis is reluctant to definitively name or categorize. Instead, the pleasure of uttering mind, tongue and pen converging, is the point. The language of dream, of the absurd, is staccato, in short sentences. Space and time contract, the difference between place and subject, place and body, shrinks, exchanges, becomes transparent, transfigured. A panel of judges denied Davis an artist's residency, citing the ‘laziness’ of her writing, her over-reliance on contractions. Can’t instead of cannot. Won’t instead of will not. How contraction in language cost her the gift of time, and yet its precise rhythm is the vehicle of her writing, how she approximates the experience of time in the mind itself. Davis' talk intensified my current revistation of Ana Hatherly's Tisanas, which blend poetry, prose, fable, Buddhist koan, chronicle and philosophical meditation into tight little sachets Hatherly calls “neo-prose,” “near-herbal teas,” and “proto-tonics.” Hatherly, also a painter and filmmaker, says the teas are “an attempt to salve the wound between thought and dream,” and they use a number of strategies, cinematic, painterly and poetic, to do so. Each “tea” chronicles an event, featuring characters ranging from pigs to keys to islands to serpents. The tisanas are an ongoing project, questioning the idea of a “finished” work, and stand instead as “eternal objects.” As of 2006, Hatherly has published 463 tisanas in Portugal, her native country. Perhaps a third have been translated in English, but only about fifteen translations have been published. The tisanas often begin with a period, a full stop, and a lower case letter. Perhaps this is a way of contracting time, action and scale, converging it onto a single point, the beginning of a proto-tonic event, a call to focus or attention to mark the experience of writing. In Tisana 262, the author appears as “a blind man who is given a short, cold pause to see by.” Other tisanas seem to perform this as a textual strategy as well as philosophy. How shall we hear this full stop before seeing the event that succeeds it? As a breath? A click? A rise in texture, like a curb between street and sidewalk? The numbering of the tisanas apparently does not reflect the order of the writing. Hatherly refuses the spirit of the system, preferring instead Umberto Eco's “fruitful disorder.” Yet the groupings of teas do yield a sense of continuity without forfeiting the dreamlike quality they possess. Entering another language transforms reality syntactically, something Lydia Davis well knows. 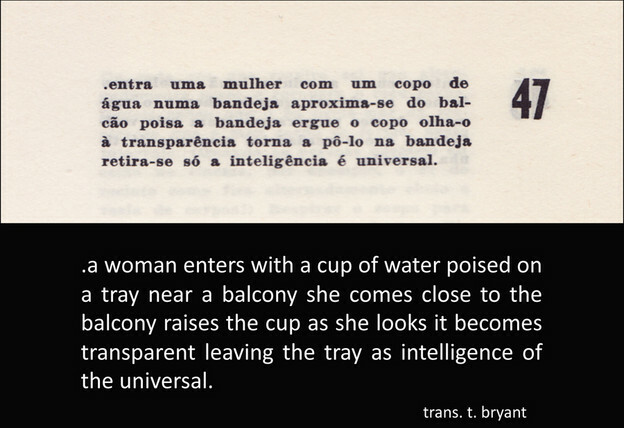 In Tisana 47, above, I wandered for a time into Portuguese to experience Hatherly's near-herbal tea for myself. I cannot vouch for the quality of my translation, but in not-knowing came a new solidity in recognizing the (il)logic embedded in language, and a vigorous shedding of my own syntactical habits in the dusk of another’s sonic, sense-making and sensory reality. “At issue here” says Maurice Blanchot, “is a translation or a transcription of this project into the language of the night, not its implementation; and the anxiety is not provoked by the discovery of the disquieting realities that might be gathered in one's innermost depths, but rather the motion of looking into oneself and seeing nothing but the contraction of a closed, unlit space.” In contrast to the anxious discovery of a private abyss, what Hatherly and Davis show in the looking and sounding into oneself is that contractions, of verbs or prose, space and time, create illuminating distance without distance. My purpose is to observe and document the playfulness and tension between (un)lived experience and the artists (and audiences) who traffic in its realm. What is it to inhabit, reenact, research or conjure subjectivities, places in time and space, known or remote, experienced or invented? Does imagination entitle us as much as relation? Is the artist transformed or refigured in the process of working, a process that holds the (un) of unlived in abeyance, while it simultaneously slants experience towards the fleshed or the mythic? In this questioning, I do not solely seek answers, but instead also hope to witness evidence of things not seen, artifacts of what remains unsaid. Tisa Bryant is the author of Unexplained Presence, a collection of hybrid-essays focused on Black presences in film, literature and visual art. Her writing has recently appeared or is forthcoming in Animal Shelter, Black Clock, Bombay Gin, Mandorla, the Reanimation Library's Word Processor series and Viz, and she has written essays for the catalogs of visual artists Laylah Ali, Jaime Cortez, Wura-Natasha Ogunji and Cauleen Smith. She is currently at work on a novel, The Curator, a novella, This Prudence, and is editing Encyclopedia Vol. 3 L-Z, the final volume of The Encyclopedia Project, which she publishes with Miranda Mellis. Tisa Bryant teaches fiction and experimental writing in the MFA Creative Writing Program, and is Co-Director of Equity & Diversity, at the California Institute of the Arts. She lives in Los Angeles.